Hi James, please let me in! I won't have enough time for the RBR this year, but I might manage this. Bump for James691 - anyone know if he is away? Hi James, please issue me a number. Yes, my apologies been a very busy week in work. Can you enter me into the rally. Hi James, Just a quick edit please, as I've changed my bike. Rider 222, was Honda Transalp, now BMW R1200GS. Now I need a new photo! fishfood wrote: Hi James, Just a quick edit please, as I've changed my bike. 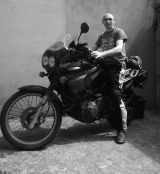 Rider 222, was Honda Transalp, now BMW R1200GS. Now I need a new photo! Good point! Could you put the 1200 on instead of the 650? Cheers mate.